Deanna is a former congresswoman and current leader of the Alexandria community. She’s a very calm and controlled person. She brags about how she would’ve been a poker player had she lost the election before the apocalypse because she can read people so well. She makes every effort to make our group feel at home, but the sense of suspicion remains high. Carol had some of the best little moments in this episode. From her clumsy removal of her rifle off her shoulders as though she’s not used to handling it, to her home-keeper get-up, to her interview where she claims to be little more than the groups den mother. She’s making an interesting play because she seems to be the only one purposefully misleading the Alexandrians as to who she is and what she can do. Daryl still acts like Daryl. Rick is Rick. But Carol is playing it completely differently. We’ll see if this strategy pays off down the road. Interviews with Deanna were worked in throughout the episode as a bit of a peek into a handful of our group. Deanna films each interview for alleged “transparency” reasons. We are shown bits and pieces of interviews from Daryl, Michonne, Carol, Glenn and Carl. It’s interesting how much, if anything, they all reveal. With Daryl and Carol there is a distance they’re sure to keep in what they say or the information they give up. 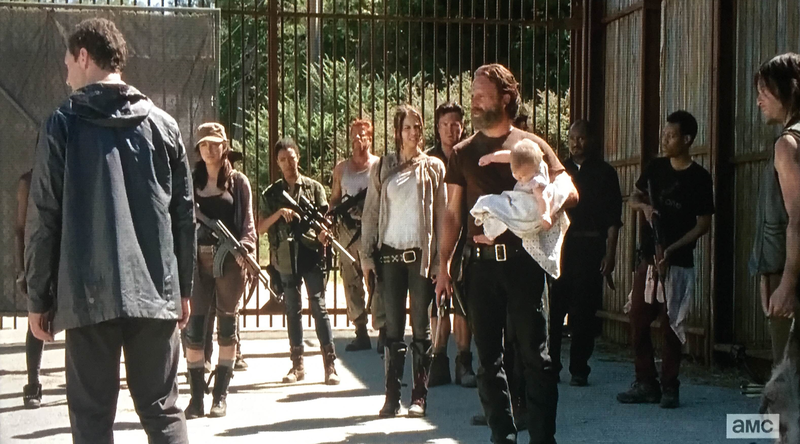 However, for Michonne, Glenn and Carl it seemed like they became comfortable in the interview and were divulging more of their personal feelings. Their desire to be safe. I get the feeling that’s exactly what Deanna was going for. Opinions on this episode will likely come down to whether the viewer was feeling the suspicious tension just below the surface throughout. Our whole group sleeps in the same house for the first couple nights because they don’t yet trust anyone. They’re checking around the homes and watching everyone with a close eye. Rick and Michonne wake up in the middle of the night, both with something like an eeery feeling despite Michonne’s earlier confession that she has a good feeling about this place. Nobody is comfortable. Is that because they’re so used to being on the road and always checking their back, or because there really is something else going on behind the scenes that they should rightly be cautious of? Perhaps the only scene to give some credence to that feeling was when Tara, Glenn and Noah went on a run with Aiden, Deanna’s son. Aiden tells them about a group of 4 who were killed not long ago when they didn’t follow the plan that Aiden set in place. Aiden and his partner then proceed to make light of a walker who they wanted to string up. They are so cavalier with it in fact that Tara nearly gets bitten before Glenn takes care of business. After making it back to the community, Glenn and Aiden square of nose to nose. Aiden takes a swing and Glenn lays him out with one punch. Daryl, of course, is nearby and spear-tackles the other guy. The contrast between the weakness of the Alexandrians and the strength of our group is greatest at this moment. 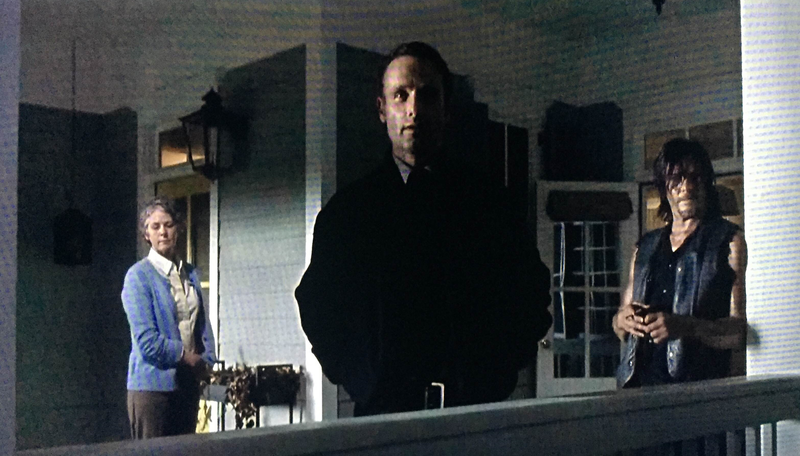 If this is the best Alexandria has to offer, then the fear that Carl voiced earlier in the episode that this place would make them weak is probably a legitimate concern. Two things happened after this fight that were very interesting. One, Deanna personally thanks Glenn for decking her son. Is this a sincere thanks, or is she playing an angle? Second, Deanna offers Rick the position of constable. She guessed him as a cop before the fallout, and now she’s offering him that position here. Again, is this a legit request based on a need, or is she playing an angle on our group? Time will tell. This was a pretty solid episode. Like I said, opinions may vary based on whether you were feeling the underlying tension. We’ve already had an episode this season where they arrived at a place and immediately left, guns a’ blazing. So we shouldn’t have expected something like that again. I think the show did a good job of keeping the viewer unsure of Deanna’s motives, and the legitimacy of Alexandria as a safe haven. Rick’s final line was great too. “We’ll make it work. If they can’t make it, then we’ll just take this place.” We have no doubt. I didn’t commit to anything last week but that will change now. Jessie is a new character from this episode. She’s who cuts Rick’s hair and is his neighbor. Rick has a brief yet mysterious ‘welcome’ with Jessie’s husband during a midnight stroll. 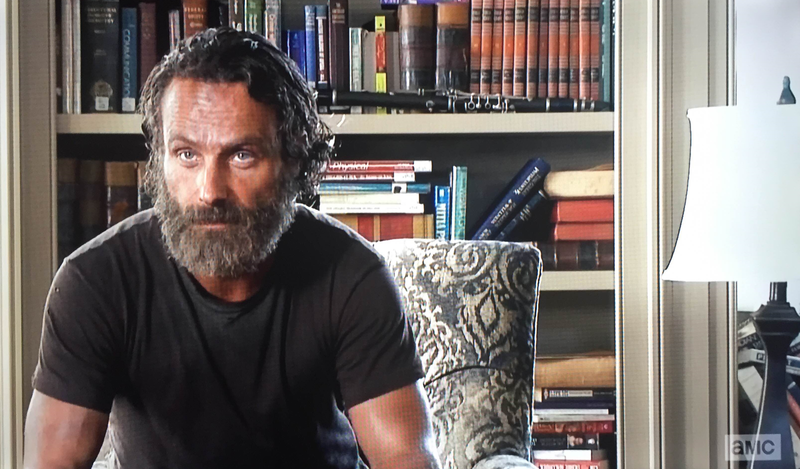 I predict Jessie’s husband will reveal something major about Alexandria to Rick or someone else in the group. Rick’s blender gun with the ‘J’ on the handle was gone when he went back for it. I predict Enid, the girl Carl meets, was sent out to get it. That may explain how Carl conveniently made it to that location when he went following her. Finally, I predict Rick’s new position as constable will put him in a position to administer a rule or law against one of his own. Likely Daryl. ← Coming Soon: Frozen vs. Tangled!